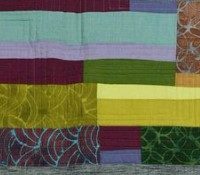 In this half or full day workshop students will learn how to free-cut and piece strips of fabric into unique “sections” and then piece them together into a quilt. 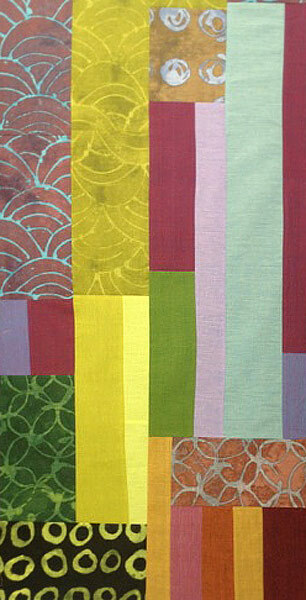 Pieced sections may also be embedded into a large negative space to create a abstract yet modern quilt. Class time will be used to learn this fun method of piecing. Full day class may allow students enough time to piece a small quilt top. 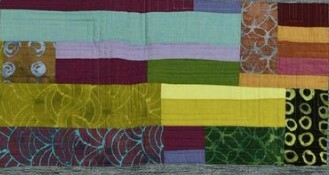 We will use a portion of the time to discuss the various ways these pieced sections can be used in a quilt. Room requirements: One student per table, one sewing machine per student, 2 irons and ironing boards. Cutting mat desirable but not mandatory. Student materials: a cohesive palette of solid color fabrics (fat quarters) and several fat quarter size subtle prints that blend nicely with the solids, neutral-colored sewing thread, fabric scissors, and thread nippers (optional). Batting and painter’s tape (crib size) is optional for use as a design wall during the class. Small cutting mat and rotary cutter is optional.